I’m not into canoeing. I prefer the kayak. But canoes are such a part of Canadian life that I am endlessly drawn to the often mystical imagery of paddling, especially in art. So many iconic Canadian moments are tied to canoeing, including the wilderness trips of Group of Seven founder and painter Tom Thomson. He died mysteriously on (yes) Canoe Lake in Algonquin Park in 1917. What sets a canoeing expedition apart is that it purifies you more rapidly and inescapably than any other. Travel a thousand miles by train and you are a brute; pedal five hundred on a bicycle and you remain basically a bourgeois; paddle a hundred in a canoe and you are already a child of nature. Source: published in French in Jeunesse Etudiante Catholique, November 1944. 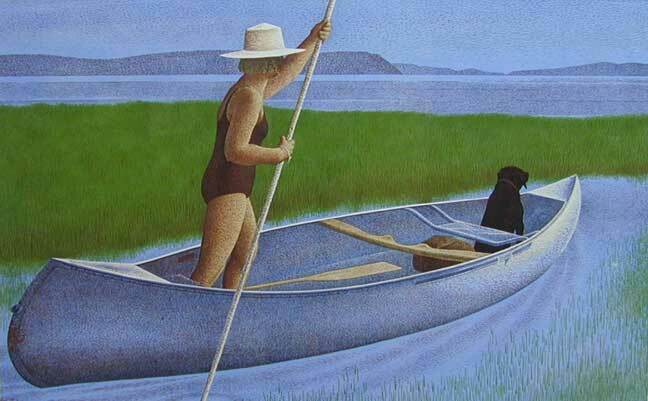 Christine Montague, Dreaming of Summer Some More series: Ghost Canoes. Oil. From the Singing Wilderness, By Sigurd Olson: “The movement of a canoe is like a reed in the wind. Silence is part of it, and the sounds of lapping water, bird songs, and wind in the trees. It is part of the medium through which it floats, the sky, the water, the shores”. Very interesting. I especially like the Peter Doig. Yes, and spectacular on the Coleville. It’s simply a canoe, in some reeds to a lake. Now, with the dog, and that a woman guiding, there is a story. His work is exceptional, as it works on many levels. I probably mentioned it before, but my favourite painting, ever, is Horse and Train. It’s Coleville at his hypnotic best. Now that hiatus is over, I will enjoy the 150series. I need to catch up! 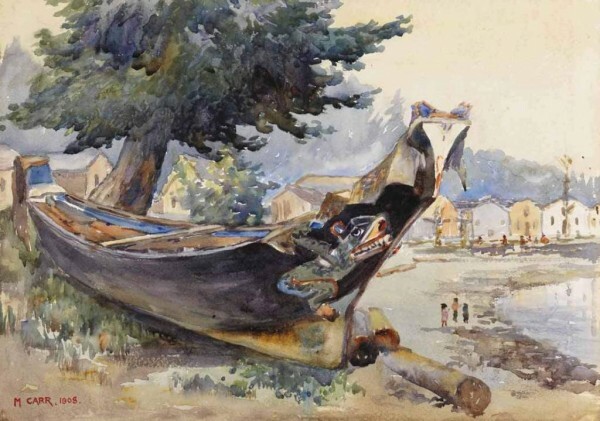 I think you’ve given us a delicious tasting of works inspired by the canoe – I’d forgotten how this vehicle is so entwined with the history and mythology of Canada, and of course, as a recreational vehicle in more modern times. Frankly, I was amazed at how attracted I was to so many of these pictures. I’m conflicted, and bedazzled by the stylised vibrancy of several of the images, but if I were being tortured to reveal a preference, I’d probably nominate Christine Montague’s Ghost Canoes. They seem more in keeping, somehow, with my memories of Canada. Oh what an interesting response. I guess it’s because so many artists have “done” the canoe that some of them (ie Peter Doig) are so stylized, as you correctly label it. I can see why the Ghost Canoes reflect your time in Canada. Not only are they frequently laid out that way, that image is more in keeping with the basic, beloved shape of a canoe. Thanks so much. I always enjoy your comments, and the thoughts they provoke. I agree – this is a lovely post. A very nice sampling of canoe art. I’ve seen a couple hand-made canoes and they were such works of art. Thank you. I’m with you completely that hand-made canoes in particular are their own works of art. Great point, especially from you as a cyclist. Thanks for the comment. Anyway, maybe you might find more canoe art for installment #2. (I did for the bike across Metro Vancouver). 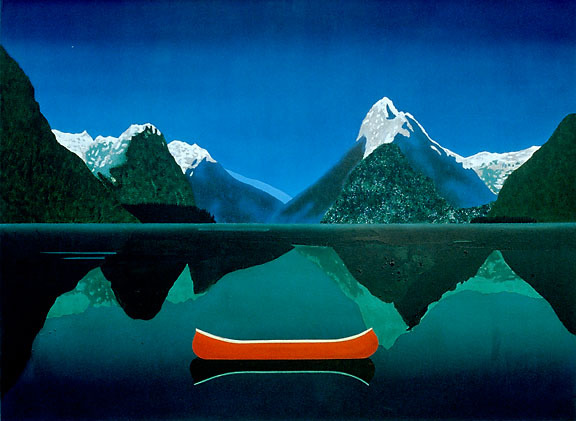 I love the canoe as an iconic symbol of Canadian exploration.